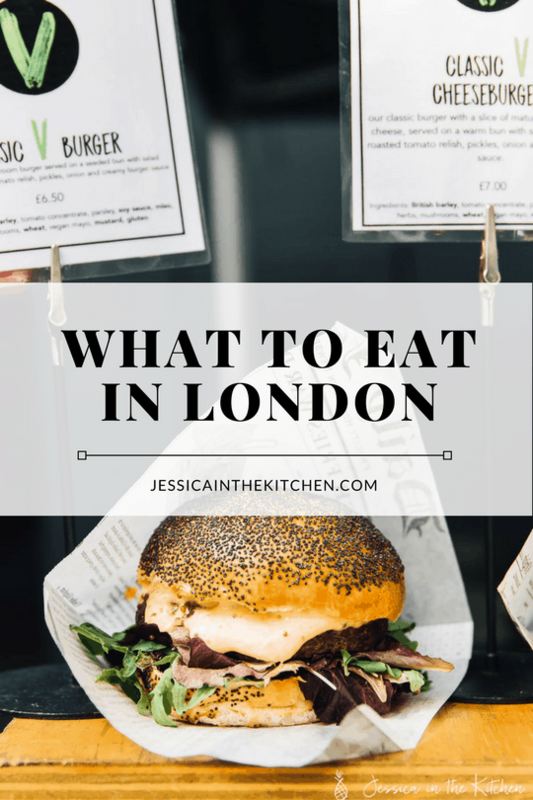 A guide for what to eat in London, plus a mini city guide for our favourite attractions while in London! 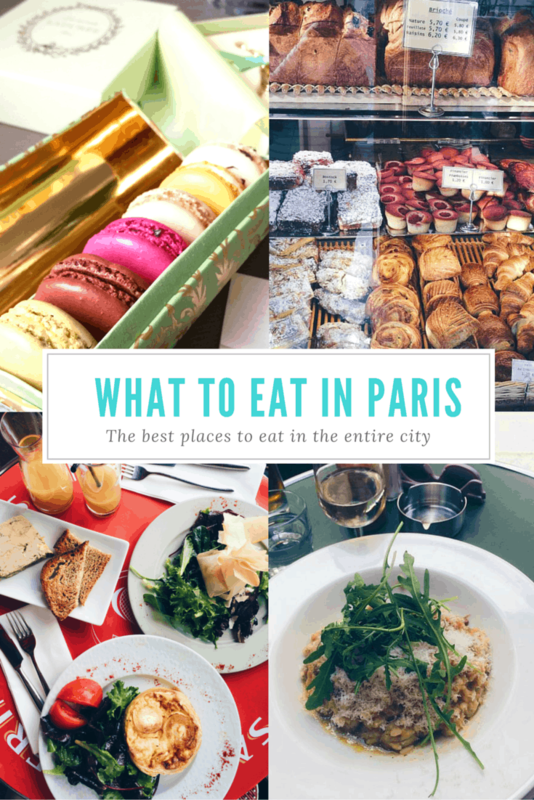 Lots of delicious places to eat at! London Town! We enjoyed our trip to London SO much!! 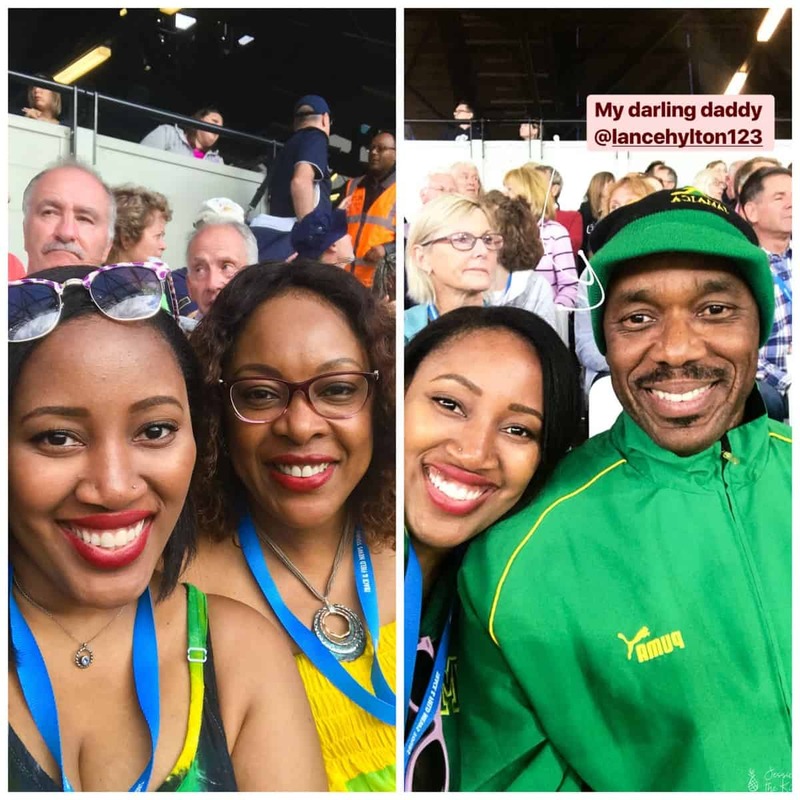 We went to London in August of this year for two weeks for the World Championships. 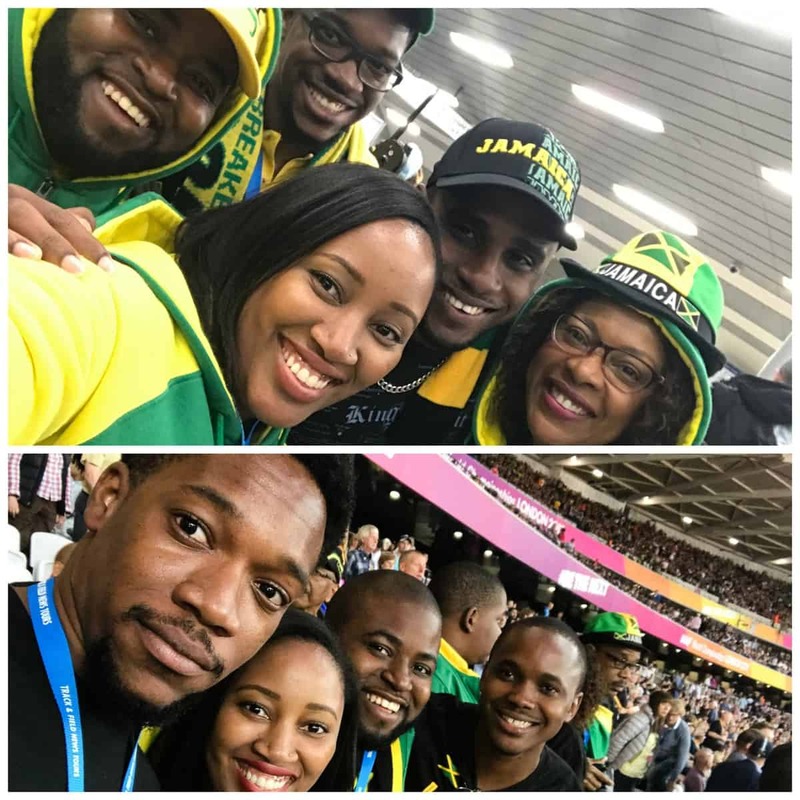 Many of you may know I’m Jamaican – so we went to support our Jamaican athletic team and to see Usain Bolt’s last run. That was a bittersweet moment – I was sad to see him go but happy for the endless excitement over the last few years. Needless to say we had a blast. 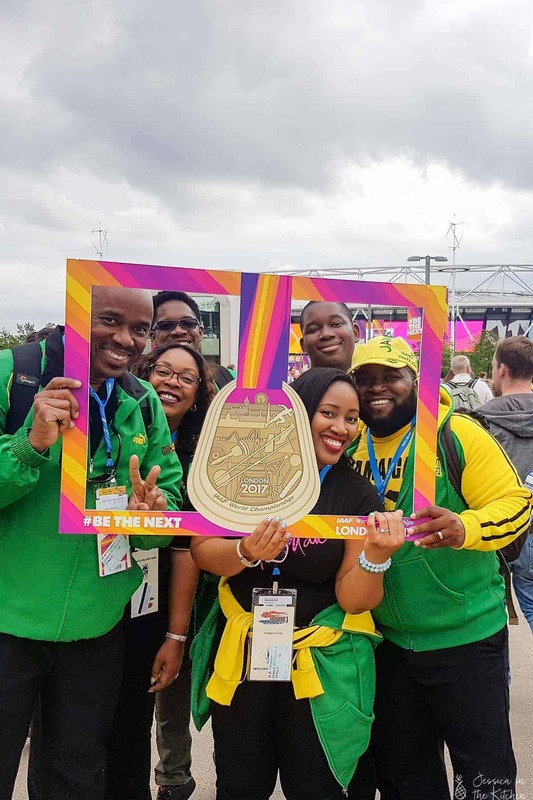 Not only did we go completely decked out from head to toe in Jamaican gear every single day to the Queen Elizabeth Olympic Stadium, we also got to really enjoy Central London. 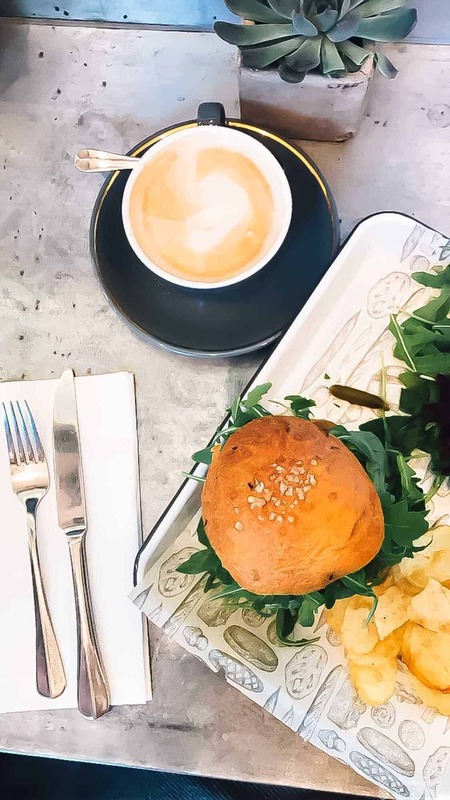 I’m sharing with you my perspective through the food – where we loved, what you need to eat in London and what you can’t miss. This wasn’t my first time in London, actually. We went in 2012 for the Olympics, and did all the tourist things then. 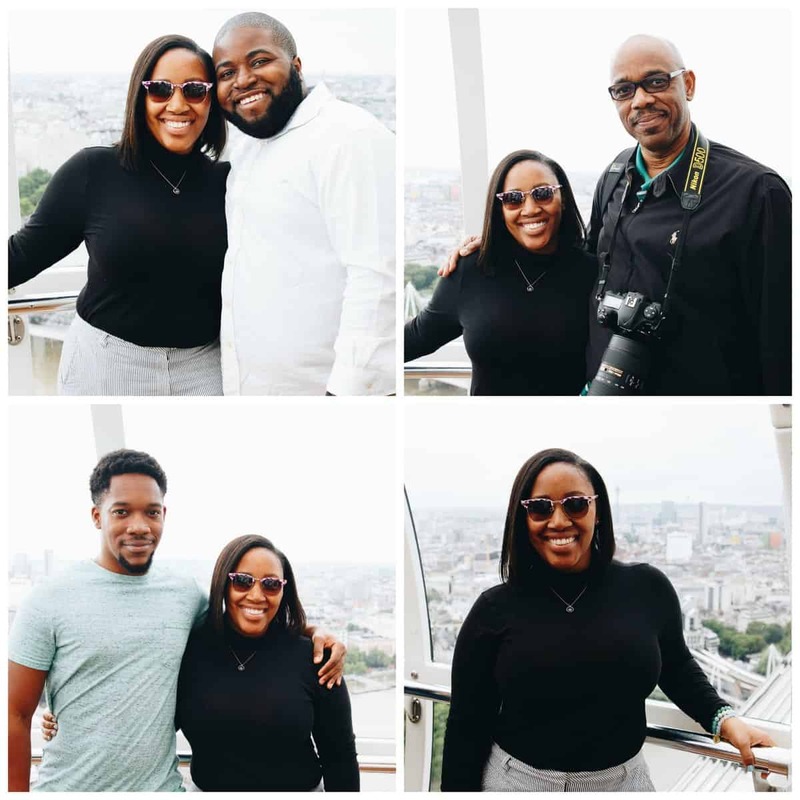 I really enjoyed that trip so much as I do our family trips in general – they’re a great opportunity to spend quality time with family while exploring a new city. Since we’ve been before, there were many things we didn’t on this trip, tourist wise. If it’s your first time I would definitely recommend visiting London Bridge, watching a play and of course checking out something fun like Madame Tussaud’s wax museum. 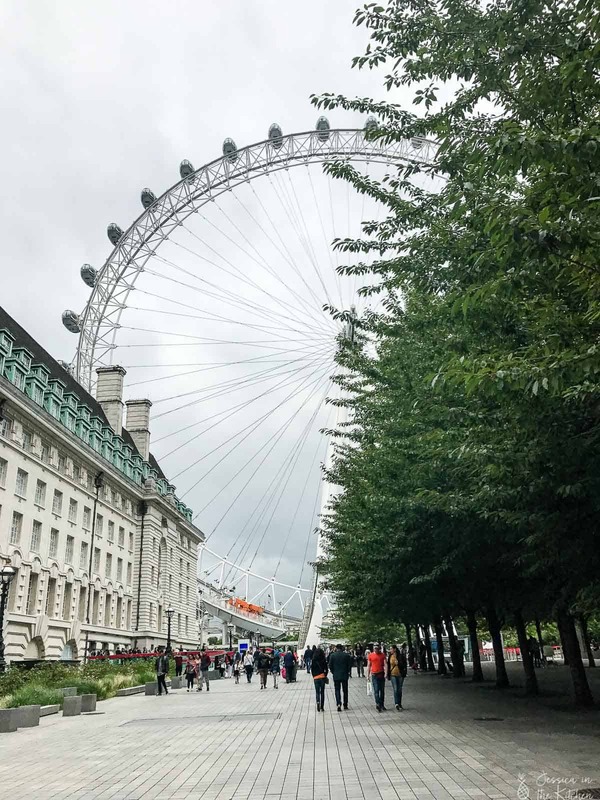 We stayed at the DoubleTree Hilton in Central London and spent about two weeks in London. Our priority when travelling is always to find great places to eat. I think I’ve said this before – I truly believe you discover a country or a town or a city through its food. 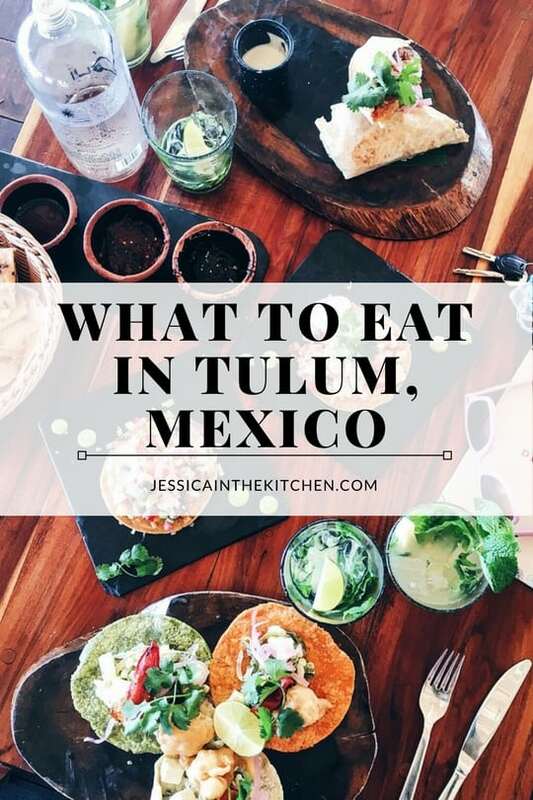 Visit all the tourist attractions, but make space for at least one truly local meal (aka not a fast food chain) to really delve into the culture. Freeze frame, record scratch! If you’re going to London, go to Borough Market. This trip was so unique from our usual trips because I normal list a bunch of different restaurants all over, but Borough Market puts a lot of divine restaurants, stalls and shops all into a few blocks of space. Go on an empty stomach, eat breakfast there, and then keep exploring. I had way more than breakfast here, and the options were truly amazing. This is a great spot if you want to get some unique food souvenirs from family and friends. More on this under lunch and dinner. Jessica in the Kitchen turned 3 while we were in London! We revamped the entire website AND changed the logo and honestly by the time it was the actual anniversary, I was pretty exhausted. Our hotel had breakfast every morning, and on this special day the Mr. let me sleep in and surprised me with this treat. I’m a sucker for made from scratch, so loved this in store made yogurt with all the delicious toppings. 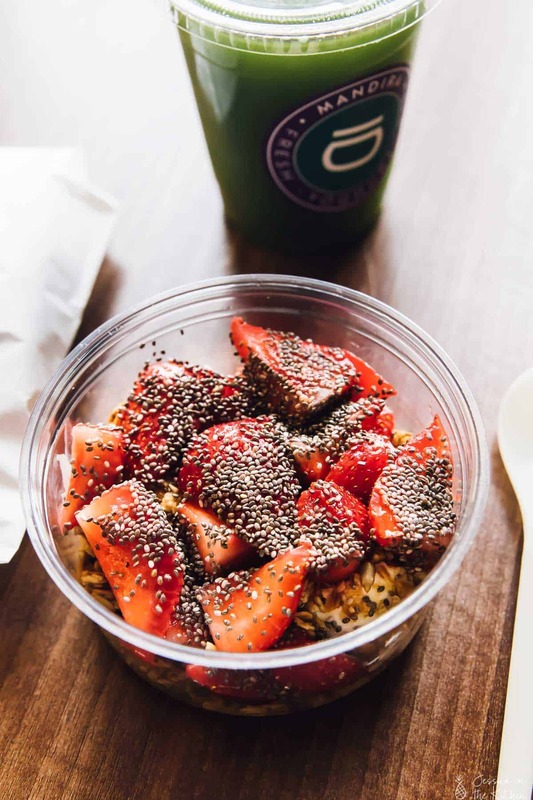 Mandira has a nice choice of healthy, fresh dishes when you want to refresh a bit. Sigh. I honestly want to cry thinking about this meal. The best meal we had on that entire trip. The Mr. and I have different views about having divine meals – he wants to preserve the memory, I want to eat, eat and eat more!! We ended up only having it once because of time constraints, and I’m actually glad because the next time we go it’ll be even better. Everything I had on this menu was divine. For reference I (we? haha) had the Pau Bhaji, House Black Daal, Garlic Naan, Mango & Fennel Lassi and the Pineapple & Black Pepper Crumble. I can’t even remember what the Mr. ordered because I was so enthralled by my food. No, mere “food” doesn’t give it justice. By the complete treat for kings that I was presented. The flavour. The presentation. The atmosphere. The authenticity. 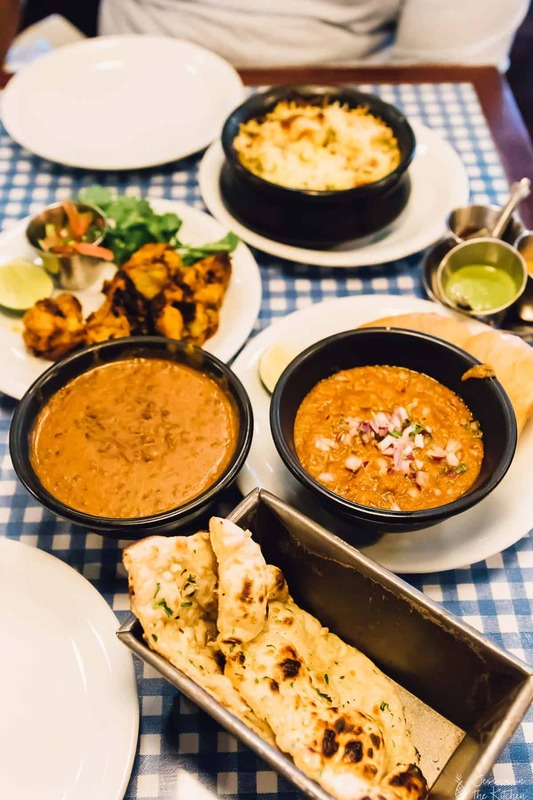 Dishoom is levels above itself. The House Black Daal absolutely blew me away and was the reason I came home and made this Vegan Red Lentil Curry. I want to perfect everything I ate and share the recipes with you because you deserve this meal. Okay okay, on to the rest of the meals! I think it’s obvious I enjoyed Dishoom. Bill’s was the very first place we ate, and as with a lot of other countries we visit, the place we chose as our “home base“. 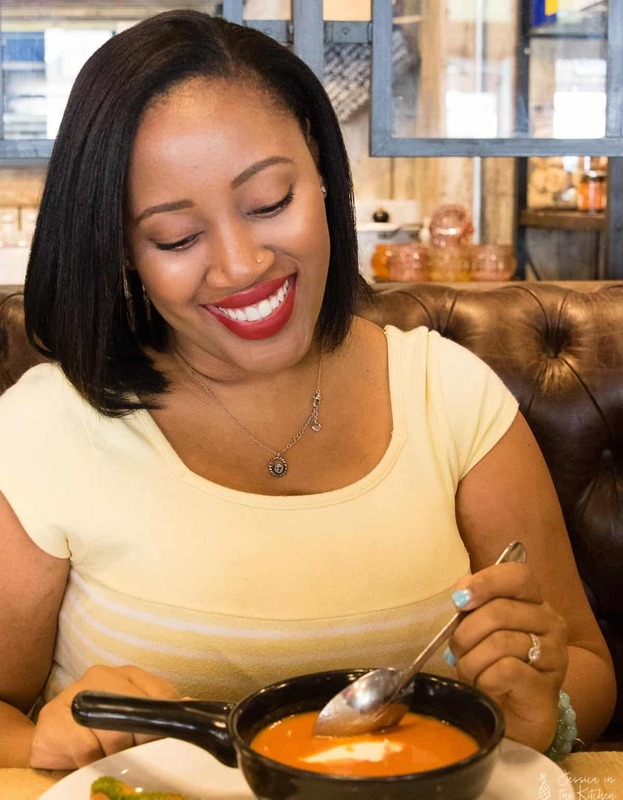 I’ve discussed the importance of having a home base before – a well priced restaurant you know is a sure win in case you can’t/don’t want to find somewhere new to eat. Bill’s was around the corner from our hotel so it was the perfect location, and satisfied 6 jet-lagged (well I was jet-lagged – both ways) Jamaicans INCLUDING a teenager so it definitely wins the family seal of approval. I got introduced to some divine drinks here and the London phenomenon of the halloumi vegetable burger. That tomato soup above went perfect with the pesto garlic bread sticks it was served with too. We went back to Bill’s a few more times since it was so conveniently located and so tasty. They even gave us a jug of Pimm’s on the house!! We visited Bronte on the recommendation of a blog post (I can’t remember it now). Okay let me say this – did I enjoy what I ate? Yes. Was it ridiculously expensive? YES. 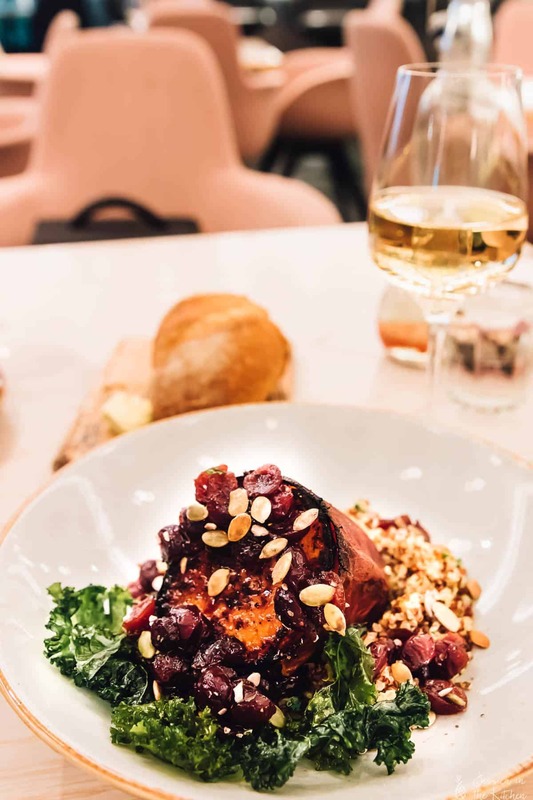 The sweet potato dish with cranberries and quinoa and crispy kale chips was heavenly, and I ate every bite. 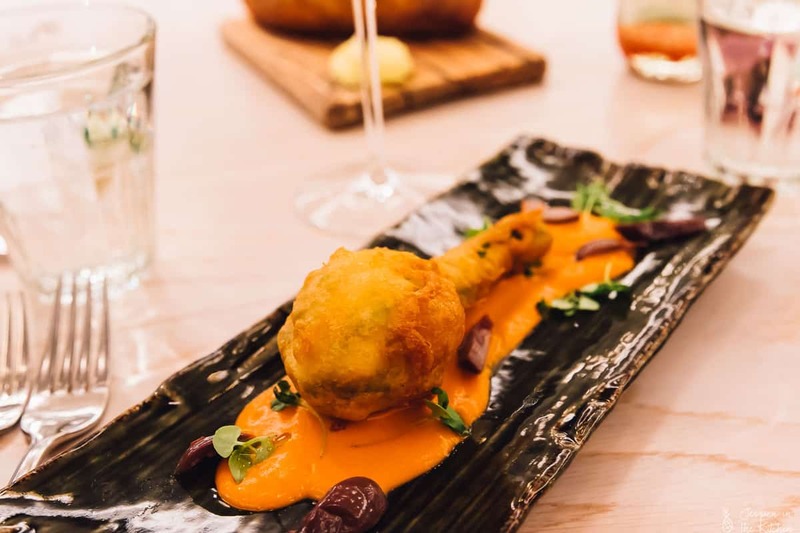 Below was my appetiser or battered zucchini blossoms which was SO innovative and creative and so yummy!! When I first read about Covent Garden, I thought it was just a shopping district. Wrong – it is so much more than that. 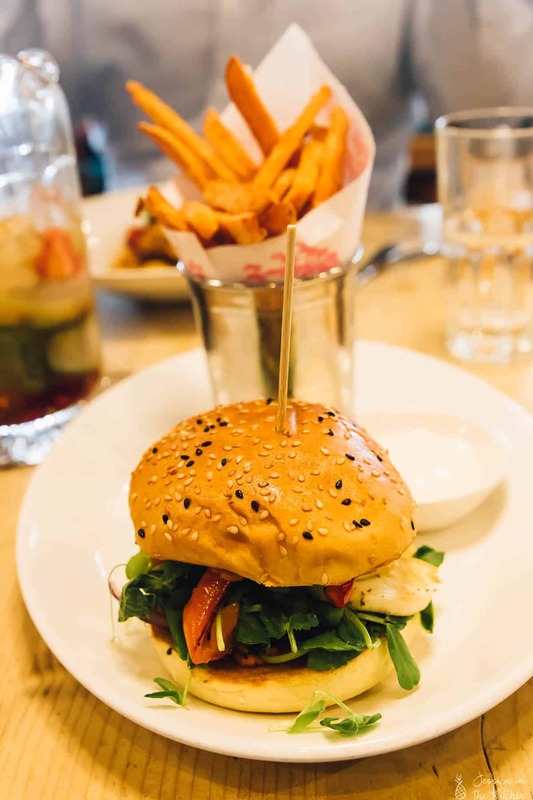 Covent Garden is THE place to be on a Saturday for lunch after you’ve had breakfast and nibbles at Borough Market. It’s loaded with restaurants from top to bottom, it has its own market, and lots of entertainment. We strolled around, ate, listened and watched performers and then strolled some more. I got to stop by the Caudalie store (my favourite vegan natural brand of skincare products) and shop, then we headed back to get ready for another night of the games. You’ll find so many places to eat here! 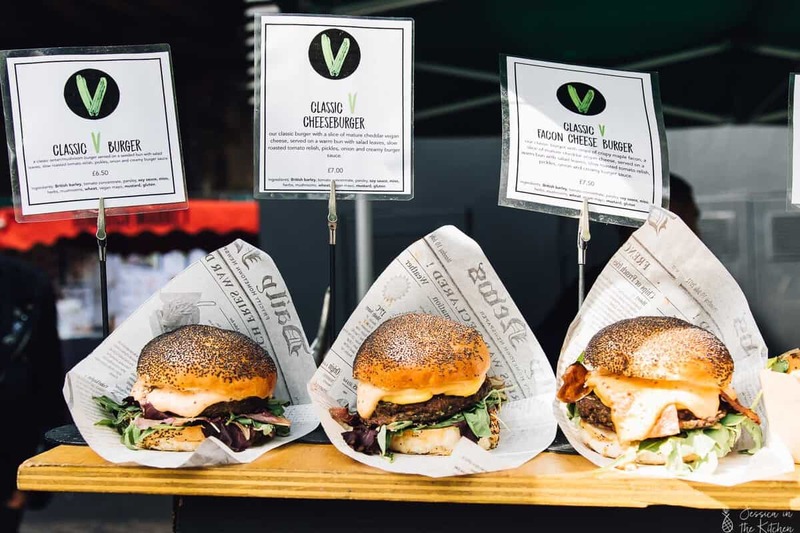 *announcer voice* We are back with Borough Market! Again, you’ll get so many great options here, ensure that you check it out! Balkan Bites – I had a divine Spanakopita Bureka for breakfast! Flaky, delicious and well priced! Big V London – OMG. Can you say the best veggie burger ever?! Okay, they absolutely hit it out of the part with this. If we go back to London, I am definitely heading to their store on an empty stomach to enjoy their entire range, then taste some of what the Mr. orders!! 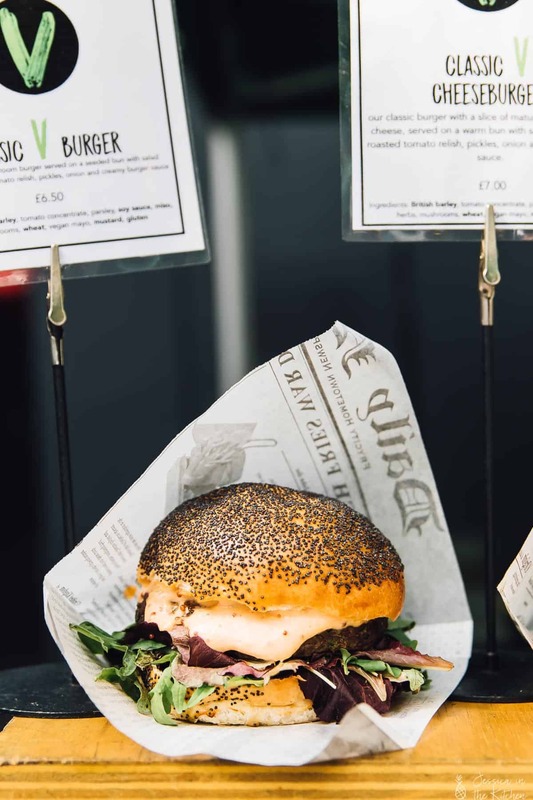 Do NOT miss this one out – this burger was filling and SO so so good! Best veggie burger I have EVER had and I don’t say that lightly! Like I said, I’ve started an official mission to rate veggie burgers around the world. So far I only have London, Jamaica and America and Mexico for veggie burgers, but it’ll be a fun little passion project as we continue to travel to try the best veggie burger in that country/city! So we also ate a lot of our dinners at the stadium, since we spent most of our nights there. 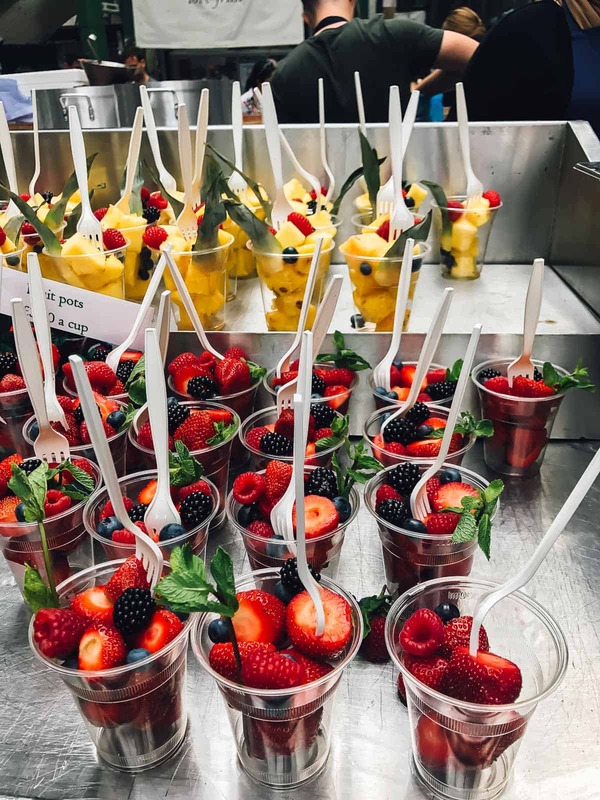 I’ll be honest – stadium food isn’t the most appealing, and it’s hard to serve a large crowd. Out of everything we ate there, I would recommend trying West Cornwall Pasty Co. They achieved quality pasties (YUM!!) and had a divine Thai Green Curry Vegetable Pasty!! 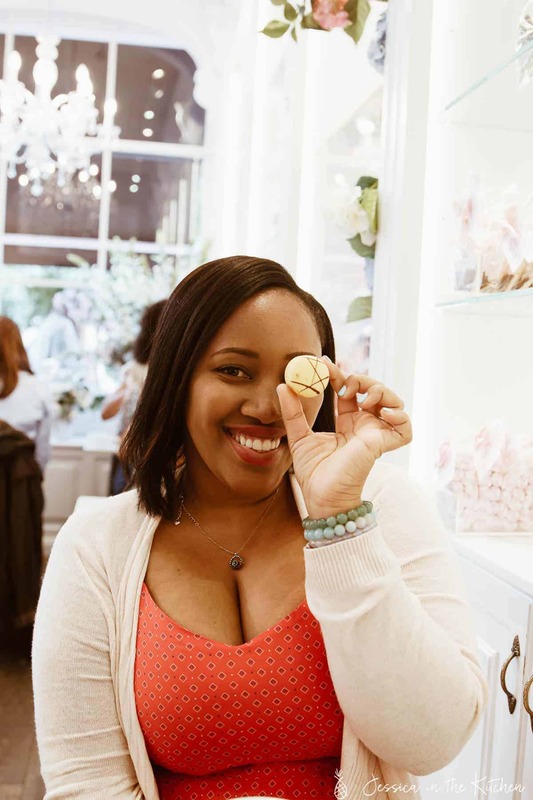 Okay, so fun fact: back when I ran my own baking company, Peggy Porschen was the first cookbook I ever bought., I was obsessed with her gorgeous cakes and studied all her tips perfectly. So it was a real full circle moment to end up in Peggy Porschen at tea time, to snag the very last table. The manager looked at me and I could tell he knew how special this was to me and said “hold on, I’ll ensure you get a seat.” If we are friends, you probably know my love of Disney and that erm, Siri calls me Princess Jessica. I really was in my own fantasy world then. The store is so beautifully decorated and oh my gosh the desserts!! The Mr. ATE his entire dessert! I was sort of hoping he wouldn’t so well, I could, but I’m so happy enjoyed his too. 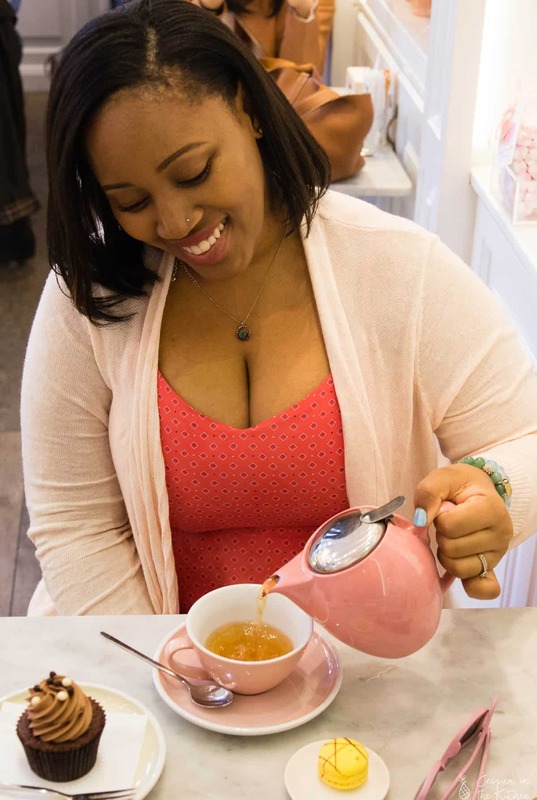 The tea was perfect and needless to say, we enjoyed ourselves. Apparently a line outside is NORMAL – we just beat it – so you know that this is a real treat. The Free From Bakehouse – gluten free, vegan and delicious large and mini desserts! Artisan Foods – real deal, divine cheesecakes, breads and pastries! This was SUCH a fun trip!! 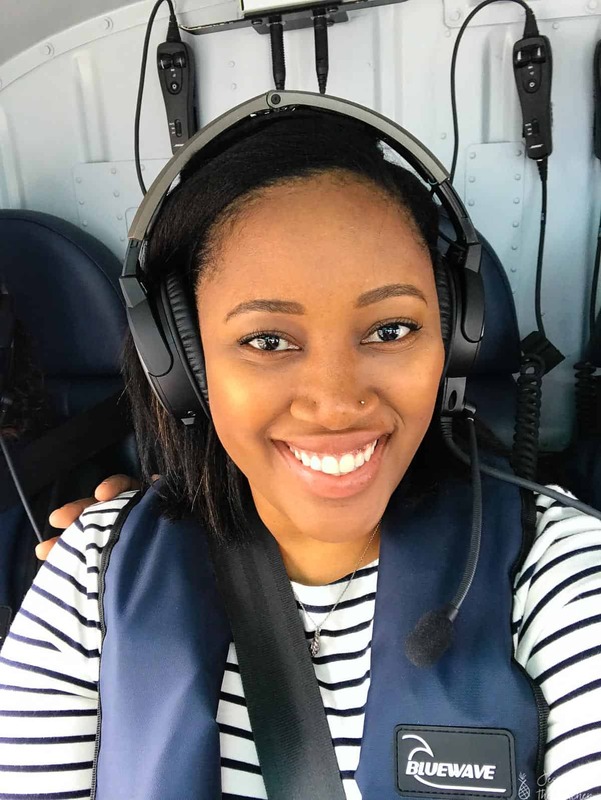 We took a helicopter ride of the entire city and got to spot everything down below. It was a great introduction/re-introduction to the city. Of COURSE you need to try the London Eye. It moves really slowly, so you get another stunning panoramic view of the city, plus opportunities to take great photos!! Do I even need to explain this? This was the reason we went to London – and it did not disappoint! We bumped into lots of friends and family while there, and had an amazing time together as a family. There’s SO much excitement, so much anticipation (because of the races!!) and SO much screaming!! You go to bed each night exhausted, guaranteeing a proper sleep, to do it all over again the next day. It doesn’t hurt of course when people want to take pictures with you JUST because you’re Jamaican!! The Mr. and I love going to museums. Right after food, it’s obvious that this is where you can learn more about a city or country’s history and background. It was a really rainy day, but that didn’t stop us. The inside was stunning, inviting and so captivating. Because I can’t end this post with a rainy picture!! Accept that you can’t do everything. London is such a great city to explore, but it is absolutely huge. Unless you’re spending a solid month, it’ll be impossible to do everything. Instead of stressing about it, do your research and focus on activities you know you’ll enjoy, and ensure you have a blast doing everything you’ve planned out. Ask a local where to eat! 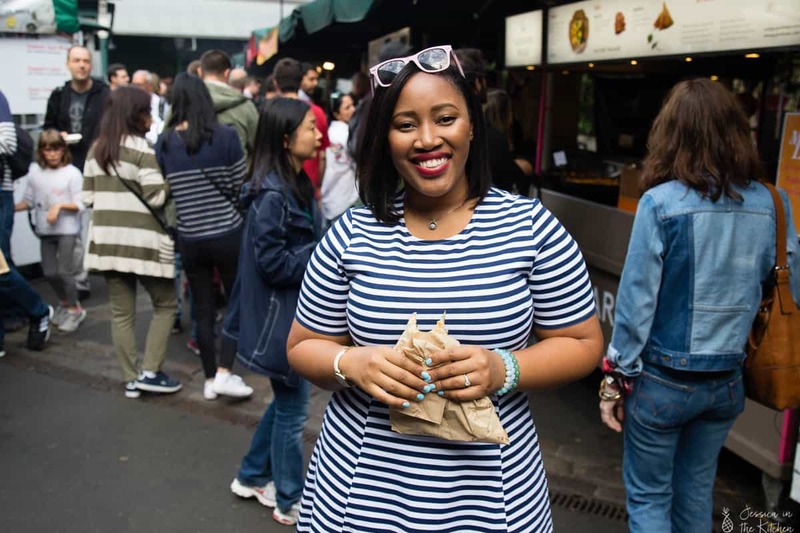 We found lots of great food options from just asking our Uber drivers where they enjoyed. It’s a great way to find local approved spots without reading endless reviews on critic sites. 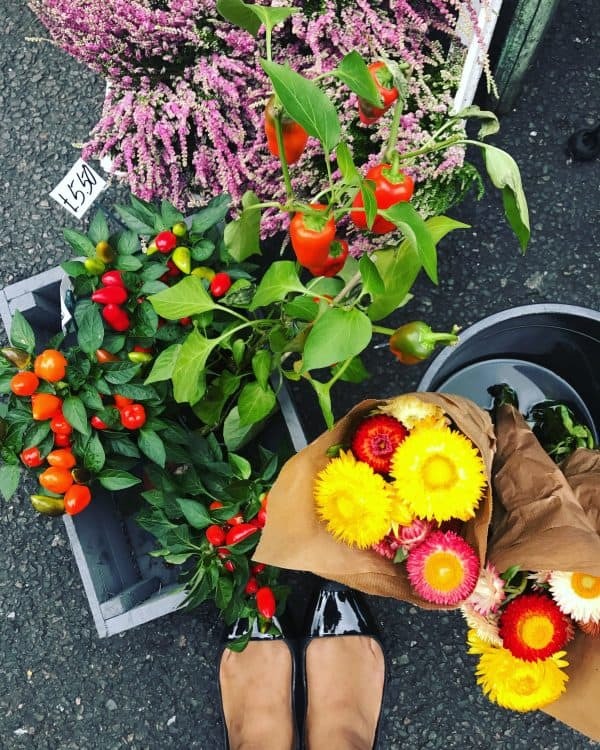 Go to Borough Market. This tip is super specific for a reason: EVERYTHING at Borough Market is absolutely delicious!! 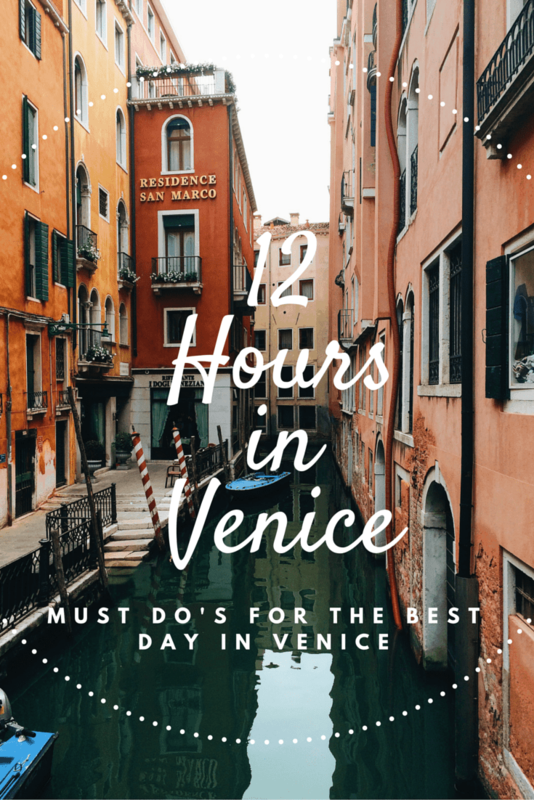 You’ll find so many amazing choices here, and it’s open almost every day so you’ll have lots of opportunities to stop by. Have/attend tea time. Tea time is HUGE in London. 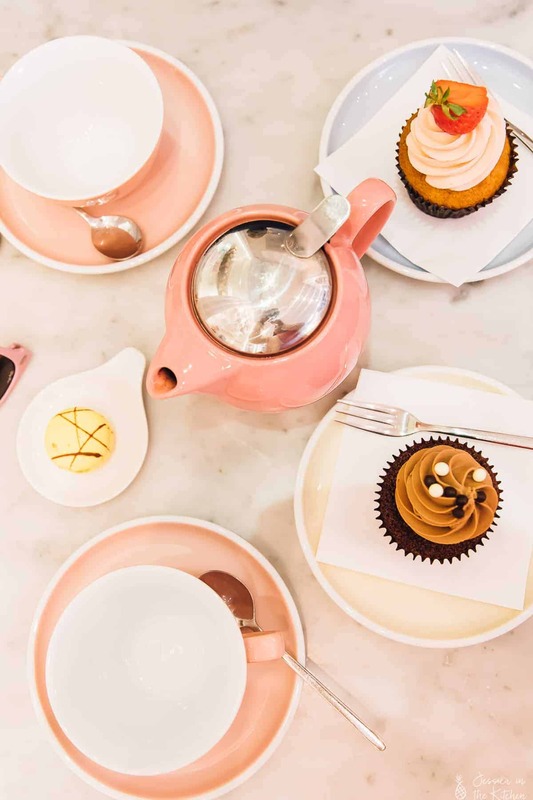 We stumbled upon Peggy Porschen Cakes (Okay okay, I totally pre-planned that trip, but the timing was a coincidence) and got the *last* table for tea. Oh my gosh, it totally changed my life experiencing such a delicious and welcoming different kind of meal! It’s a great opportunity (and excuse) to have lots of desserts around 4PM. Check out Covent Garden. Another very specific recommendation here that is so worth it. Covent Garden is covered from head to toe in restaurants of all different cuisines. It’s buzzing on the weekend and a really fun food scene, so it’s equally as entertaining and satisfying. There are also lots of mini markets, so you can try lots of mini desserts and also grab from unique souvenirs! 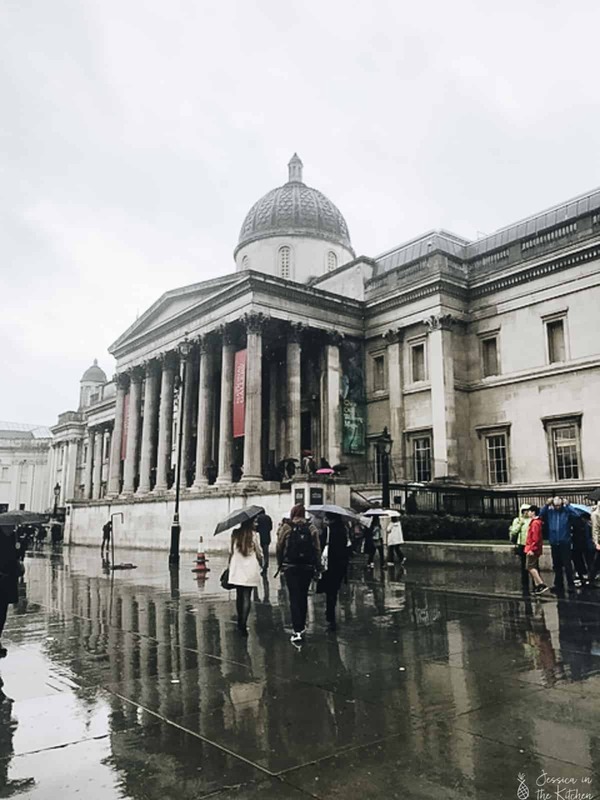 I hope this post helped to guide you if you plan to visit London anytime in the near future. Until next time friends! Aww thanks so much Kayle!! Wow..I loved this challenge jessica. I am gonna participate in it and I will forward this post to my relatives and friends who are very expert in the kitchen. Jessica, why are you making my head hurt (in a good way) with all these food pics? I can’t eat them! This post was like a great meal – full of substance and goodness. I’ve been longing to visit England, and now I want to go more than ever after reading your post. Thanks for the helpful tips. You look so pretty and très chic. I adore your style. The family pics were heartwarming. You’re so blessed to have a close-knit family. I can see the love. It was fun experiencing London through your eyes. Thank you! I’m so glad you enjoyed this post!! England is really a great scene especially if you love walking, it’s such a lovely place to walk! Thank you sooo much for your kind words!! Haha I’ll keep up the burger count! !